PrestaShop is a free Open Source content management system (CMS) built in PHP with MySQL for data storage. As an Open Source software, PrestaShop is supported by a vigourous community which ensures that the technology remains current with Internet trends and that defects are identified and corrected as the software evolves. PrestaShop is a fully featured CMS that includes an administrative interface and a shop interface. Product management, user management, content management, payment options, shipping methods and etc are configured and maintained through the administrative interface. The shop interface is used by customers to register with the site, search and browse for products, select products for purchase and pay for goods. PrestaShop software forms the basis of a top class shopping experience for your customers. Its features are continuously refined and extended to ensure that the system keeps up to date with the latest innovations in how to do business online. PrestaShop’s frontend is very flexible and graphic design is implemented using a PHP templating system which decouples your shop’s configuration and functionality from its look and feel. This allows you chop and change designs easily, for instance, to swap in a holiday theme during the winter months, without disruption to your customers’ shopping experiences. The landing page of the shop interface may be configured through the content management system. PrestaShop’s CMS allows you to easily update your home page with your latest offers or with image maps that link to products you’d like to feature or videos of your goods and services; whatever you fancy! The CMS is very powerful and allows you full control over your home page without the need for IT support or down time when you want to make changes. PrestaShop provides full support for customer registration/log in/forgotten password. See Illustration 1 for a screenshot of the registration form shipped with PrestaShop; the look and feel of the form may be customised but not the fields themselves. Users log in using their email and password. An activation by email add-on is available for PrestaShop at a cost of $140. Users are taken to their Account page on log in. For security purposes, users’ passwords are not emailed when a forgotten password request is made (passwords are stored in digested form and cannot be decoded to clear text); the user enters their email address and uses a system-generated password to log in and update their account details. PrestaShop’s user accounts are fully featured and users may view their order history, create wish lists, save products for later purchase and update all their details as appropriate. All customer details are also accessible from the CMS which can further be used to track user interest in particular products and thereby create sales leads that might otherwise go unnoticed. 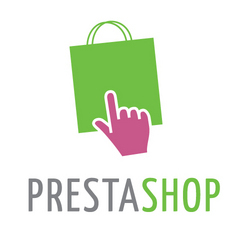 PrestaShop ships with a shopping cart which supports the addition and removal of products prior to log in. Products may be selected from the online catalogue with all appropriate options – size, colour, quantity and etc as configured for a particular product through the CMS – and then added to the cart. Customers may view their cart and add or remove products at any point before purchase. PrestaShop includes support for several payment gateways including PayPal and Google Checkout, see Illustration 2. During payment processing the customer remains in the shop and is not directed to a third party site; your payment gateway account information is configured through the CMS. PrestaShop provides support for sophisticated management of shipping and delivery options as shown in Illustration 3. The CMS allows administrators to configure pricing for different carriers in different delivery zones. PrestaShop ships with keyword search functionality and persistent access to search can be assured across the shop interface. Customers may browse the categories from the shop navigation. Categories are created, updated and deleted through the CMS. PrestaShop’s CMS is packed with features and configuration options and Illustration 3 shows the main areas of management accessible through the administrative interface: Catalog, Customers, Orders, Payment, Shipping, Stats, Modules, Employees, Preferences and Tools. Each of these main sections includes subsections to give the PrestaShop administrator fine-grained control over the shop. The PrestaShop demo provides access to a living example of the CMS. Have a play to see how PrestaShop can be used to meet your requirements in terms of management of: users, categories, content, products, payment, orders and much more besides. Admin users may create, view, edit and delete customers from the shop. Customers may be ordered on any of the data fields and PrestaShop supports customer search. PrestaShop also allows customers to be organised in groups and displays a history of logged in users’ carts. Admin users may create, view, update and delete catagories and sub-categories. Categories and subcategories may also be created using CSV import. PrestaShop supports product import via CSV file; CSV files may be created in Excel and ‘saved as’ CSV. Imported products are associated with the category defined for that particular product as included in the CSV import. All product information may also be created, viewed, edited and deleted through the CMS. PrestaShop supports sophisticated product management including the definition of attributes, such as special colours or finishes, that may increase or decrease a product’s price. PrestaShop also tracks inventory and ensures that sold out products are displayed but not available for purchase in the shop interface. PrestaShop is a fully-featured CMS which allows admin users full control over all the shop’s content including, for instance, meta data for products and all ‘static pages’ such as About, Terms and Conditions, Privacy and etc. These static pages are created, edited and deleted through the CMS. PrestaShop also ships with a newsletter functionality. PrestaShop ships with a Google Adsense module which allows admin users to include an AdSense script. PrestaShop also ships with a Specials module that may be configured to display special offers. PrestaShop ships with support for a selection of payment gateways. See Illustration 2. PrestaShop’s CMS includes access to all order information and the ability to create, view, edit and delete orders.